The majority of my business is advising people on college and grad school essays, but you won’t know what essays are required until you have a list of colleges to which you’re applying – and that’s often hard to settle on. Few applicants know what’s really out there. And here’s something that colleges won’t tell you: their websites are advertisements for the college. Yes, they include plenty of information you need, but they are limited to promoting their own institution. They won’t compare their programs to others, and their descriptions of the college’s atmosphere are going to be as positive and generic as possible. Even when you’re lucky enough to visit, the tour too is an advertisement. What do you do when you want to know more? It’s true that in this age of the Internet, reference books have lost some of their usefulness. If you want to know the top ten undergraduate business schools, the best way to find out is to google it. But if you need less precise information about colleges, scholarships and even writing your college application essays, there are a few books that I recommend – and recommend getting in paper format, not electronically. Enter my favorite college resource book: The Best 382 Colleges: 2018. The publisher adds a number every year, so when the 2019 edition comes out in August, the title will be The Best 383 Colleges. The book is a great mix of lively narratives about the characteristics and atmosphere of the schools (based on administrator and student surveys) and hard facts concerning admissions figures, financial aid offerings, most popular majors, and a measurement I love: “Profs interesting rating” (PIR) and “Profs accessible rating” (PAR). FYI: Harvard’s PIR is 65, while Vanderbilt’s is 96. Harvard’s PAR is 62, while Wellesley’s is 94. This is a great book to pass around the family. Parents often find it as interesting as students do. The same publisher, Princeton Review (not connected to the university), also publishes another reference book with essential information for many families: Colleges that Pay You Back: The 200 Schools that Give you the Best Bang for Your Tuition Buck: 2018 Edition. In addition to information on financial aid, graduation rates, and – yes, again – my favorite PIR and PAR stats – this reference book provides a list of 9 institutions with no tuition (including West Point, the Coast Guard Academy, and the Webb Institute in Glen Cove, NY, where about 100 students a year study naval architecture and marine engineering) and a 22-page list called “Great Schools for the Highest Paying Majors” with subheads such as ELECTRICAL ENGINEERING, with median starting salary and Median mid-career salary. Shorter lists include Best Alumni Network, Best Schools for Internships and Top 50 Colleges That Pay You Back. “Sin and Syntax dwells in contradictions and dabbles in the eloquence of tradition, the intelligence of creoles, the decadence of slang. We’ll root around where language is most playful: in the pop, the vernacular, the mongrel tongues. We’ll examine how the highbrow and the lowbrow define the edges of prose and how the middlebrow dooms it to mediocrity. We’ll diss legalese and computerese and ditch the lifeless rhythms of Standard Written English. Please shoot me an email if you’re interested in talking about your own or your high school student’s college application needs this coming summer and fall. 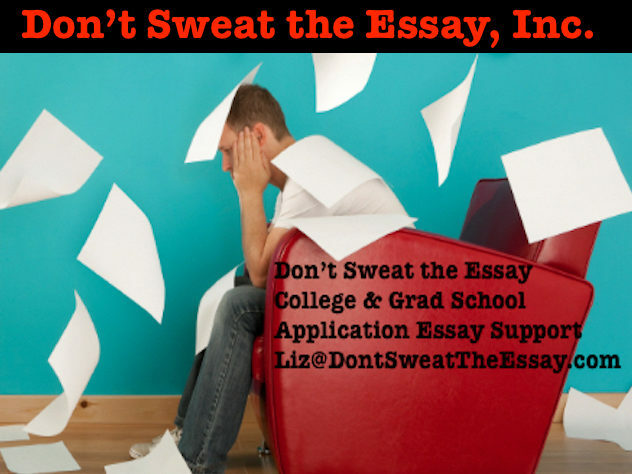 Liz@DontSweatTheEssay.com ~ Thanks for checking in.